Then Sings My Soul (Special Edition) by Robert Morgan indeed is a delightful collection to own, and I am so grateful to Booksneeze.com to make this book available for review. 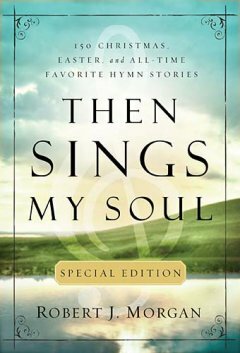 It is a collection of 150 hymns for Christmas, Easter, Thanksgiving, general all-time favorites, etc. Each hymn is presented in a two-page format, the left page is the music score of the hymn, and the right page is a devotional styled story behind the hymn. The music score is written in an easy to play format, and being someone who enjoys playing piano, this book is really a great compilation to have. .....................and the all-time classic children hymn, Jesus Loves Me This I Know. While pondering and praying about these things, we came to realize anew that our courage doesn't come from a stable world, for the world has never been stable. Jesus Himself was born in the cruelest of times. No, we have babies, raise families and risk living because the Resurrection is true! Furthermore, this special edition comes with the deckle or jagged edge with French flap cover that gives the book a classical feel. I give a 5-star for this book. Why Did The Son of God Submit Himself To Baptism?